Debut albums, like any other opportunity to make a first impression, come but once. 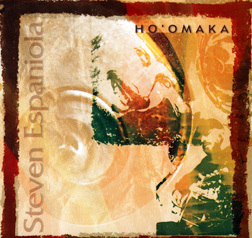 Steven Espaniola makes the most of his opportunity by introducing himself with beautiful renditions of Hawaiian standards. An expatriate who returned home to record, Espaniola sings in a smooth falsetto and plays almost every instrument -- acoustic bass, eight-string ukulele and several types of acoustic guitar. Espaniola does an excellent job with such Hawaiian perennials as "Makee 'Ailana" and "Kalama'ula." He also displays his talent as a writer with a pair of originals. "Calroselani Rose" showcases his slack-key technique, and "Hokulani," written as a gift for his wife, marks his debut as a lyricist. Both fit in nicely with the classics. This perfect debut is topped off with liner notes that not only provide lyrics and basic translations, but enough additional information to reveal the personal significance of each song selected. Bravo, Espaniola! The Hawai'i Academy of Recording Arts unilaterally eliminated the Hoku award "Single of the Year" category in 2004, but local artists continue to find singles useful in getting their music into the market. Lana, a singer with a voice reminiscent of Taylor Dayne's, steps forward with a three-song CD single that presents her doing old-style dance music and something closer to trance. Any of these tracks could work as fresh material in the contemporary mash-up scene. Sumira, a former protégé of Hoku award-winning producer Roy Sakuma, recorded and released her solo debut album almost a year ago without his guidance. Lacking Sakuma's promotional savvy, it fell far short of achieving the critical mass necessary to establish her as a viable local recording artist. It also didn't make the final ballot at this year's Hoku awards. Sumira's soft pop-lite style will appeal to local middle school students with a taste for karaoke-style arrangements and sweet, occasionally pitchy vocals. Magic this is not, although there are times it rises above karaoke level. She's at her best with originals. "It's True" has appeal, although it's spoiled by tinny faux strings. Generic sonic filler spoils several other songs as well. Unfortunately, Sumira chooses to invite comparison with national artists by doing basic versions of national pop hits. That's a bad idea for any young local pop singer. In short, there's a lack of creative edge and mainstream appeal here.